at Northwestern Medical Center in St. Albans with her loving family at her side. Judith was born on November 28, 1937 in Burlington, VT, the daughter of Robert and Katherine (Horner) Aldrich. In her earlier years, Judith was employed at UVM and at Mammoth Mart as the snack bar manager. She loved spending time with her family and especially enjoyed “card night”. 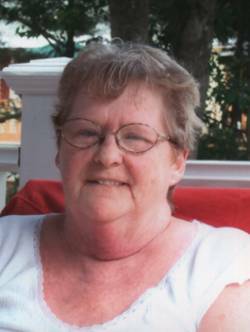 Judith loved to play bingo and also enjoyed camping and doing crafts (beads, necklaces and bracelets). Judith is survived by her children; Peggy Laplante and her husband, John, Sherry Brier and her companion, Mark LaFlam, Cindy Shambo and her husband, Robert, Sandy Letourneau and her husband, Allen and Chad Ives; grandchildren Crystal Messier, David Brier, Michael Church, Eric Gilbert, Kyle Blouin, Leah Blouin, Brittany Estus, Cortney Garrand, Caleb Letourneau, Kaylie Latulippe and Cole Ives; 11 Great Grandchildren, her step- sister, Joyce Bruner and several nieces and nephews. In addition to her parents, Judith was predeceased by sons, Walter Mercier, Jr. and Rudy Ives; a granddaughter, Michelle Farnsworth; and siblings, Walter “Red” Aldrich, Robert Aldrich, Alberta Barrett, Beverly Flynn, a step brother Earl “Bud” Flanders and a step-sister Helen Spears. The Mass of Christian Burial will be offered on Monday, October 8, 2018 at 11:00 AM at Holy Angels Catholic Church, 246 Lake Street in St. Albans with the Reverend Maurice J. Roy, officiating. Interment will follow in Holy Cross Cemetery, St. Albans. Should friends desire, gifts in Judith’s memory may be made to Franklin County Animal Rescue, 30 Sunset Meadow, St. Albans, VT 05478 or American Heart Association, VT Affiliate, 12 Hurricane Ln, Williston, VT 05495. Judith’s family would like to thank St. Albans Health and Rehab, especially Stacy, Diane and Carly, for the wonderful care provided to her during her stay.